Next to the living room, the kitchen is one of the most used rooms in a house. The kitchen is also one of the harder rooms to clean because of grease stains and hard to remove food stains. 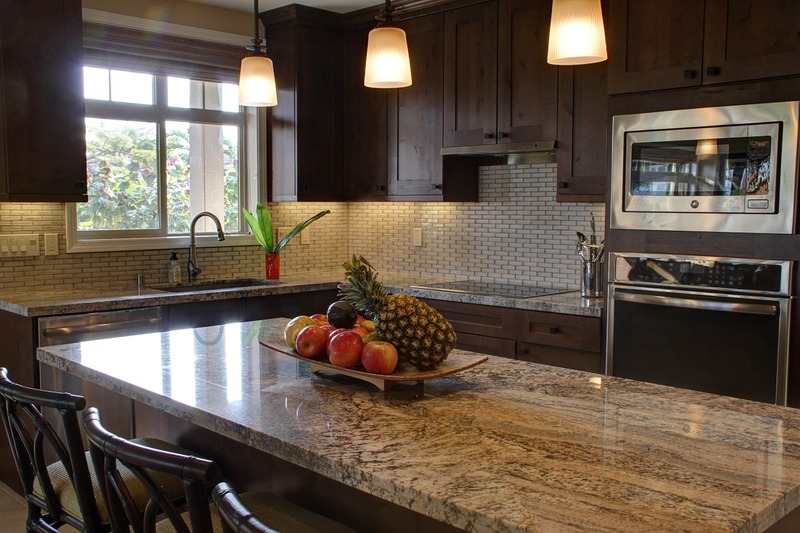 Here are some tips to help you keep your kitchen clean and smelling fresh! Sponges can get moldy fairly quickly. To make your sponge last as long as possible, use binder clips to keep it standing straight up. It will dry much quicker and last longer. Also, every few days, place your dry sponge in the microwave for two minutes. It will kill any germs that are on the sponge. Your cabinets can get greasy from whatever you cook on the stove. If you have white cabinets, this can be unsightly and grease can be hard to eliminate. If you mix two tablespoons of Dawn dish soap with two cups of water, it will create a cleaning solution that will rid you of greasy cabinets. Simply rub the solution, going with the wood grain, with a cloth. Then get a clean sponge with warm water and wipe any remaining soap and dry with a clean towel. If you don’t clean your garbage disposal often, it can give your kitchen a foul odour. To clean your garbage disposal and sharpen the blades, freeze vinegar with pieces of lemon in an ice cube tray. Then throw a few vinegar ice cubes in the disposal. The ice will sharpen the blades and the vinegar and lemon will make it smell fresh and clean. If your microwave has stuck on food stains, it may be hard to clean. An easy way to clean your microwave is to combine ½ cup of water with ½ cup of vinegar in a microwave safe bowl, and microwave for a few minutes. Allow the microwave to cool down and then wipe with a sponge or a cloth. The steam from the water and vinegar should come right off. If you have stubborn stains, just microwave the mixture another minute or two longer and wipe again. To make your sink sparkle like the day you got it, you only need a few ingredients. Evenly sprinkle baking soda all over your sink. Get a sponge or an old toothbrush and scrub the whole sink. If you have a tough sink that just doesn’t want to be clean, you can soak paper towels in vinegar and lay that on top of baking soda. Let it sit for 20 minutes and wipe clean. That should make your sink look brand new. If you have a gas oven, your stove burners can get pretty dirty. But with their unique shapes and constant food exposure, it can be hard to clean them. A quick and easy way to clean your stove burners is to put them in a bag with ¼ cup of ammonia and let it sit overnight. The ammonia fumes dissolve the grease and hardened oil. Then, the next day, just wipe clean with a sponge. If you have an electric stove, first drizzle Dawn dish soap over the stove, then sprinkle baking soap on top, then hydrogen peroxide, and scrub. Then let it sit for a few minutes. After you wait two to three minutes, just wipe clean. Make sure to dry it completely so there are no streak marks. You can also wipe it down with a microfiber cloth to get rid of any fibers that the paper towels can leave behind. If your oven doesn’t have a self-cleaning option, it can get pretty dirty. Oven cleaners can be harsh smelling and full of chemicals. But you can create a greener version to clean your stove. First remove your oven racks and set aside. In a small bowl, mix ½ of baking soda with a little bit of water. Add the water a little bit at a time; you’ll want to make a paste. Spread the mixture all over your oven and stay clear on the heating elements. Let the mixture sit in your oven overnight or at least 12 hours. After that waiting period, use a damp dish cloth and get rid of as much of the dried baking soda as you can. Then spray some vinegar on any remaining baking soda. Do a final wipe down to get rid of all the baking soda. Then add more water or vinegar to give your oven a nice shine. Then replace your oven racks. Since you're cleaning the inside of the oven, you might as well clean your oven racks while you’re waiting! Line your bathtub with two old towels. Then fill your bathtub with very hot water until the racks are covered. Then add ½ cup of dishwasher detergent. Let it soak for four hours or overnight. Then, use a non-abrasive scrub brush or a sponge to get rid of any remaining tough spots. Rinse with water and replace back in your stove. Your refrigerator has an important job--it keeps all your food fresh. You don’t want your refrigerator to be grimy, dirty, and have an unpleasant odour. But you need to be sensitive to what you use to clean the inside. If you wouldn’t want to eat the chemicals, you shouldn’t have them in your fridge. First, remove all your food. Spray your fridge with a solution of vinegar and water and wipe down. If you can remove any shelves or drawers, wash with soapy water and dry, then dry the rest of the fridge. Finally, replace the items in your fridge. This is also a good time to toss any expired items.